studio smc photography | Sandra Costello: CUPCAKES! Today (Tuesday, that is) I photographed an awards event for Smith College in Northampton. One of the highlights of the event was the dessert: pink, white and yellow frosted cupcakes:) Yum! It became a central prop in many of the photographs and made my job a lot more fun. 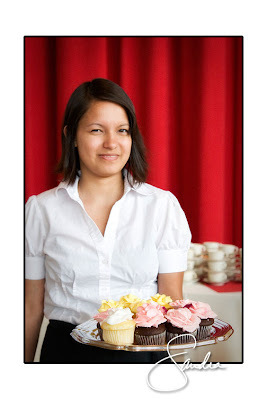 In the photo above a student/server was willing to show off the fabulous cupcakes! And with the red heavy curtain in the background it make for a decadent shot.